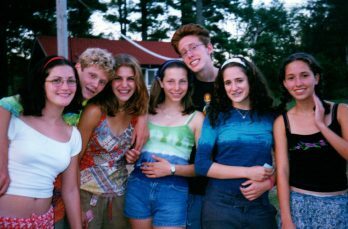 It’s no doubt that a summer at Camp Interlaken can impact a lifetime. 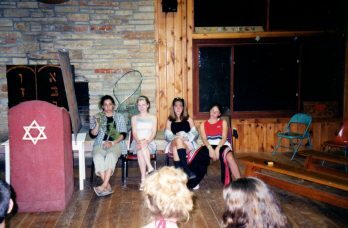 Interlaken alum, Beth Glassman, reminisces on her past summers on Lake Finley with friends, cabinmates and camp programs below. To get in touch with Beth or shop the “Top Picks for Camp” on her company website, please visit Blue Frog Apparel. We’d love to have more guest bloggers featured on our site! If you are interested in contributing an article to the Interlaken blog, please email swezelman@jccmilwaukee.org. 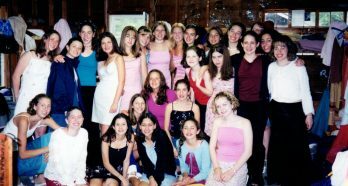 The smell of a camp fire, swimming in a freezing lake, or even hearing someone say the word “announcement” (from which I still have to restrain myself from shouting out in song) are all things that remind me of my time at Camp Interlaken. As you get older, it’s these little things that are constant reminders of the carefree days of childhood. It’s these little things that put a smile on your face and make you wish you were we back on the Machaneh yelling, “Boker Tov”. It’s these little things that make you so grateful that these experiences are in your life. I have so many memories of camp life: watching the fireworks on the Fourth of July, participating in Campstock dressed up in our best hippie gear, constantly guessing when color war and KTO would break, and honestly, just having fun. Looking back, I’d have to say that my favorite times were doing the Shabbat walk, singing songs around the camp fire, going caroling in K’far, and most importantly, finding the best people on earth. 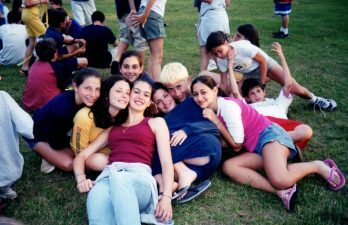 To this day, 16 years since I last attended camp, I still keep in touch with a lot of my camp friends. Tovah Kravit and I always meet up with Jake Kavalar when he is in town for work, and I used to always see David Winter in Naples when we would both be visiting our grandparents. Sean Grossberg, Matt Ausman, and the Davidson twins (Ari and Josh) all came to visit Tovah, Sara Caswell, Elyse Amigo, and myself. To quote one of my favorite CIL peeps, Mr. Jake Kavalar, “Camp friends are the best friends”. It’s those days, with those people, that make you envious of your former self. I want to have another water fight, play another round of The Dating Game, go to some chugs, and have some nosh. I just want to be on a permanent camp vacation. Don’t we all? And with all the fun, you can’t forget the drama; Who’s dating who, who’s not friends anymore, who got the lead in the play, and who just got dumped. The good and the bad are all part of camp and you know what, I wouldn’t change a second of it. I only attended CIL for 3 years, which to me seems impossible because I have enough memories to last a lifetime, but those 3 years are nothing compared to some of my former campmates. Some of them started in third grade and transitioned right into counselors. That right there is evidence of an amazing camp. You won’t have these experiences anywhere else. At this stage in my life, I am happily married to a non-former camper, who is perplexed by my obsession with CIL and the people I met there. I guess you just don’t get it unless you experience it. We have the most adorable 3 year old, who I cannot wait to send to camp and I’m almost envious of her future time there. Almost a year ago, I started my own online children’s clothing store, Blue Frog Apparel, that sells boys and girls clothes for ages newborn-12 years old. I have to say, my favorite season to buy for is summer, because I can’t help but gush over the awesome camp items I find. Having the right outfit for Shabbat, Campstock, or any of the night activities is crucial. I know you all remember the intense deliberation or staking claim to your friend’s outfit for the next Shabbat walk. It’s all a part of camp life.